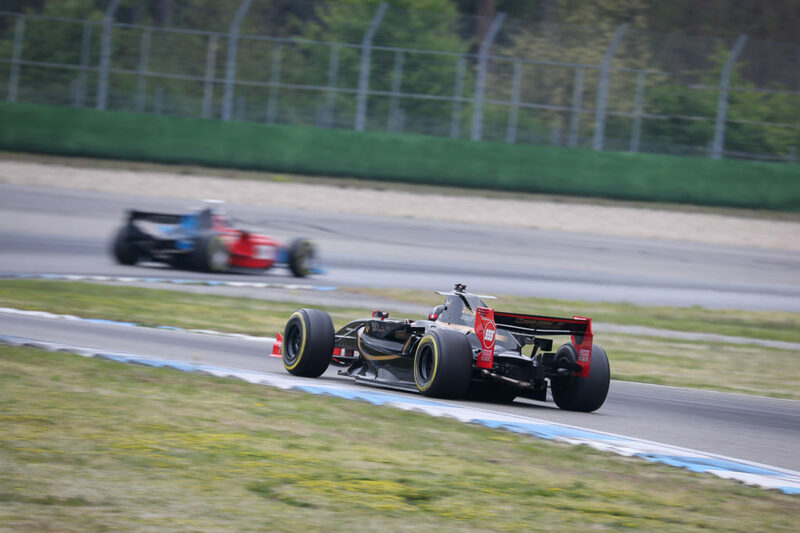 After a very crazy 2017 kick off race in Hockenheim on Saturday (22/04/2017), things worked out considerably better for the second race at the Hockenheimring on Sunday. Eleven drivers made it to the starting grid of the race. Unfortunately five drivers had to cancel the race, mainly resulting from technical reasons or crashes. So there was no way to race for Klaas Zwart (Team Ascari) after his crash in Saturday’s race. A fact, as well drivers as fans regretted a lot: “I missed Klaas a lot on track. He is always one of my strongest competitors, so racing with and against him is much more fun”, Ingo Gerstl (TOP Speed) said. While weather conditions were way better than on Saturday, which led to a crazy race, there was a smooth raceday on Sunday for BOSS GP without any crashes and no time under yellow flags or with safety car. First six spots of the grid where dominantly taken by Gerstl, Johann Ledermair (Ledermair Motorsport), Phil Stratford (Penn Elcom Racing), Florian Schnitzenbaumer (TOP Speed), Wolfgang Jaksch (F-Xtreme Racing Team) and Mahaveer Raghunathan (Coloni Motorsport) for all 18 laps. These drivers finally made it onto the podiums of the OPEN and the FORMULA class. While Gerstl again raced a start-finish victory and lead the grid during the overall race time of 25 minutes, he secured his second P1 of the season and is leading the OPEN class ranking list by the maximum of 50 points. Phil Stratford showed a great performance like on Saturday’s race again and took it to P2, followed by Wolfgang Jaksch with his first podium ever in BOSS GP. Stratford and Jaksch take according positions in the ranking list of the OPEN class as well. Podium of the FORMULA class of race 2 in Hockenheim. After P2 in first season race on Saturday Johann Ledermair took it to P1 of the FORMULA class in Sundays race and showed a quite bigger smile at the podium ceremony than on the day before, when he wasn’t that happy with P2. “The race worked out well for us. We still need more time and races to get more familiar with the new tyres by Pirelli”, the 25 years old Austrian explained. 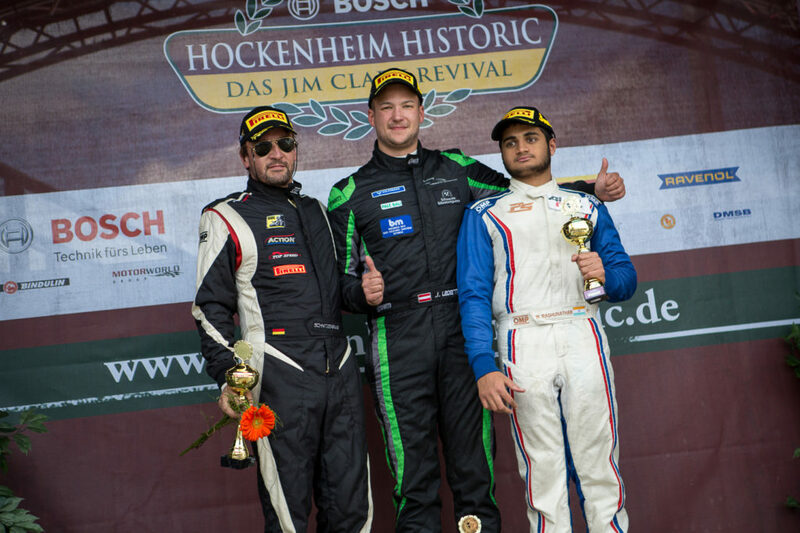 Schnitzenbaumer on P2 and, as in race 1, Raghunathan on P3 completed the podium. After the first two races of the season Johann Ledermair is now leading the overall ranking list in the FORMULA class with 47 points, followed by Mahaveer Raghunathan (Coloni Motorsport) and Florian Schnitzenbaumer (Top Speed), both with 40 points. More informations about race 2 of BOSS GP season 2017 is to come. So long find the detailed result of the race here: Hockenheim 2017: Results of race 2. After an turbulenced filled season kick off at the very first race of the year the starting grid for the second race on Sunday afternoon is set. Second race of the season during the “Hockenheim Historic” will start at 2:15 p.m. Expectations and anticipation of the drivers are huge. Highly ambitioned is Mahaveer Raghunathan (Coloni Motorsport), P3 in the FORMULA class in Saturday’s race 1 and starting from position 5 in race 2. “I will be much fast than in race 1 and I want to win”, the 18 years old Indian says. Meanwhile Ingo Gerstl, overall winner of race 1 and P1 in the OPEN class in Saturday’s race and starting again from pole position in race 2, is hoping not only for good weather conditions but also for “a real challenge after the disastrous first race”. Oh what a crazy kick off race for the season 2017 this was. 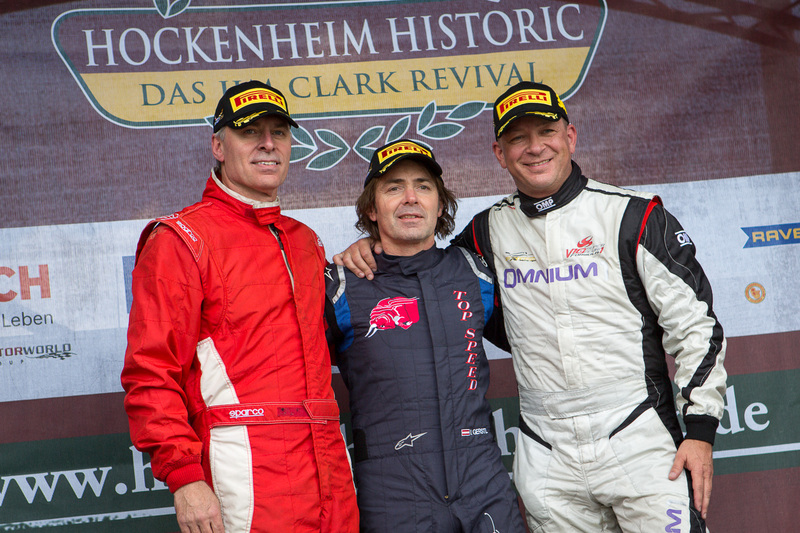 With one hour delay in the ambitious scheduled programme of the “Hockenheim Historic” the drivers raced onto the track for the first podium spots of the season. The grid had quite a compact number at this point: Only eigth drivers finally started in the first BOSS GP Championship race of the season, which was overshadowed by freaky weather conditions. Rain? No rain? Finally it was a decision just by seconds – rain tyres or no rain tyres? Exactly when the BOSS GP grid starts in their warm-up lap for the race all of a sudden rain started out of the thick blanket of clouds for the first time of the day. As a consequence couple of cars dropped out of the race already before the start. Including Wolfgang Jaksch (F-Xtreme, OPEN class) with the Super Aguri, whose car-rescue took quite an amount of time of 15 minutes. Due to permanent delays of the programme-schedule the race management decided, to cut the official race time down from 20 to 12 minutes for the eight drivers left at the grid after the troubled race-intro. When the engines were started, the next safecty car period was just a question of seconds: Already in the first turn (“Ravenol-Kurve”) Klaas Zwart (Team Ascari, OPEN class), one of the favourites for the first podium spots of the season, was out of the race after a crash into the barriers. Starting grid at Hockenheims first race 2017. When the safety car had left the circuit, the biggest point were the driving capabilities of the drivers during the challenging weather conditions. “After turbulences and exits of a couple of cars already in the beginning of the race, my only goal was, to finish the race without any damage”, explained Andreas Fiedler (Fiedler Racing, FORMULA class). The newcomer not only rolled up the field from behind in his very first race ever at BOSS GP, he also raced the best lap time (1:39.941 min) and secured P1 at the FORMULA class in front of Johann Ledermair (Ledermair Motorsport) on P2 and Mahaveer Raghunathan (Coloni Motorsport) on P3. BOSS GP safety car on track at Hockenheimring. The OPEN class was dominated by Ingo Gerstl (TOP Speed) with a start-finish victory, which put the Austrian as the overall winner of the race and meant P1 at the OPEN class podium. He was followed by Phil Stratford (Penn Elcom Racing) on P2. Since Gerstl and Stratford were the only OPEN class driver left in the grid, there finally was no P3 in the first race of the season. Accordingly Ingo Gerstls reaction after the race: “That was a disastrous race! It started dribbling, when we left the paddock. The outdoor temperatures were way too cold for the slicks. So we had to change the tyres, rain stopped, rain started again, we saw plenty of crashes. The remaining race time I was just holding to my experience and instinct, to finish the race without any trouble and keep the car on the track. Lap time didn’t really matter for me.” At the qualifying in the morning he had impressed with a fabulous time of 1:20.174 min, during the race he put his best lap to 1:40.382 min. “I saw Klaas [Zwart] next to me, hitting the wall. Finally I am really happy, that I finished. But – that was no brilliant performance, one clearly have to point that out.” For the second race on Sunday afternoon (2:15 p.m.) Gerstl is not only hoping for good weather conditions, but for “a real challenge after the disastrous first race”. Podium of the OPEN class of first race in Hockenheim. Fiedler benefited from a penalty for Johann Ledermair (Ledermair Motorsport), who had led the field of the FORMULA class at practice sessions and qualifying. 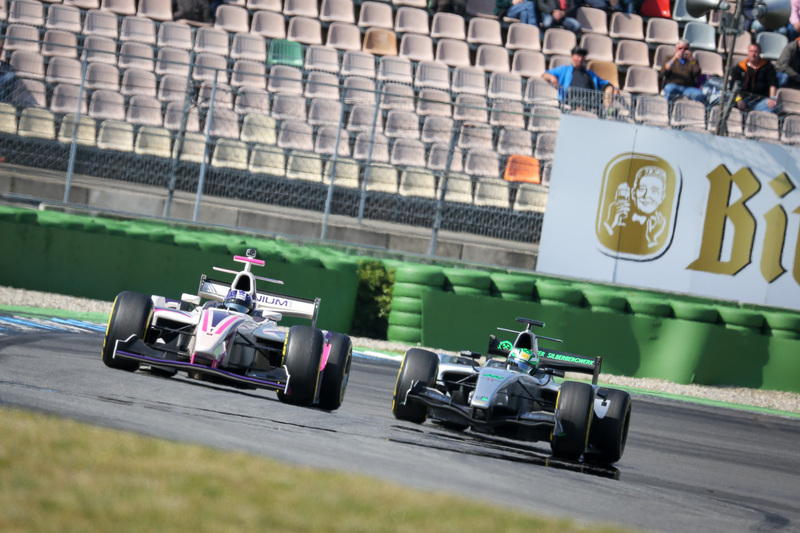 The 25 years old Austrian got an 10-second-time-penalty due to rule-violation, as well as Italian Salvatore de Plano (MM International Motorsport), who finished as fifth at the FORMULA class. 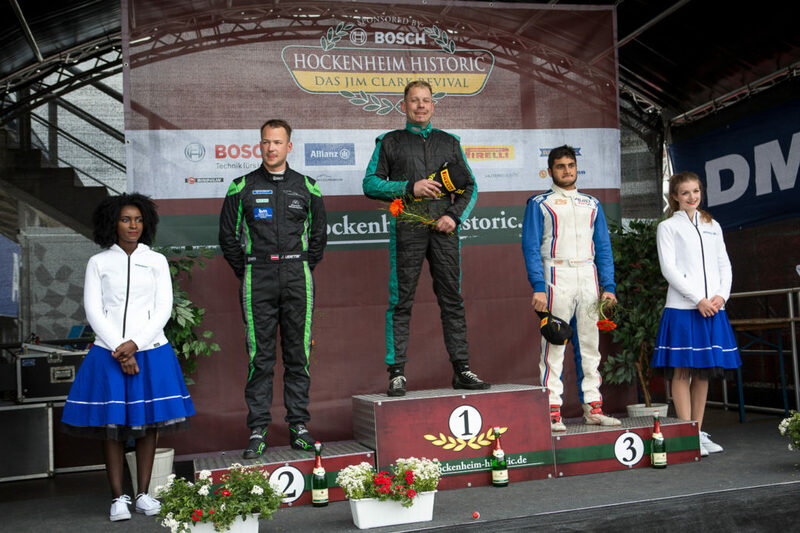 Podium of the FORMULA class of the first race in Hockenheim. Highly ambitious for the second race on Sunday is Mahaveer Raghunatan, P3 of the FORMULA class: „I want to dedicate this podium to my grandfather, without whom I wouldn’t race here”, the 18 years old Indian says. “The potential of the race was higher than my result, if I wouldn’t have raced with Slicks but with rain tyres. But I am very happy with the podium. I will be much faster in the race on Sunday and want to win then”, the youngest driver of the grid was focusing on Sunday’s race directly after the podium ceremony. Find the detailed result of Race 1 at Hockenheim here: Hockenheim 2017: Results of Race 1. Find the report of the qualifying at Hockenheim here: Hockenheim 2017: Report of Qualifying. See the report of second free practice at Hockenheim here: Hockenheim 2017: Report of second free practice. See the report of first free practice at Hockenheim here: Hockenheim 2017: Report of first free practice. Find all informations about “Hockenheim Historic” here www.hockenheim-historic.de and the website of Hockenheimring itself at www.hockenheimring.de. 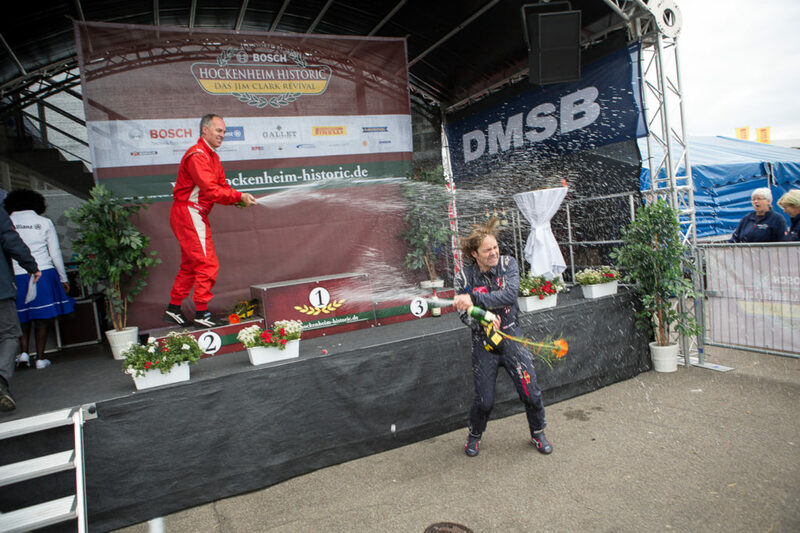 With a fabulous lap time of 1:20.174 min Ingo Gerstl, reigning OPEN class champion of the BOSS GP series, secured the pole position for first race of the season in Hockenheim on Saturday morning. The Austrian even raced a much faster lap, but his sensational lap in 1:19.689 min was canceled by the race officials due to rule violation. 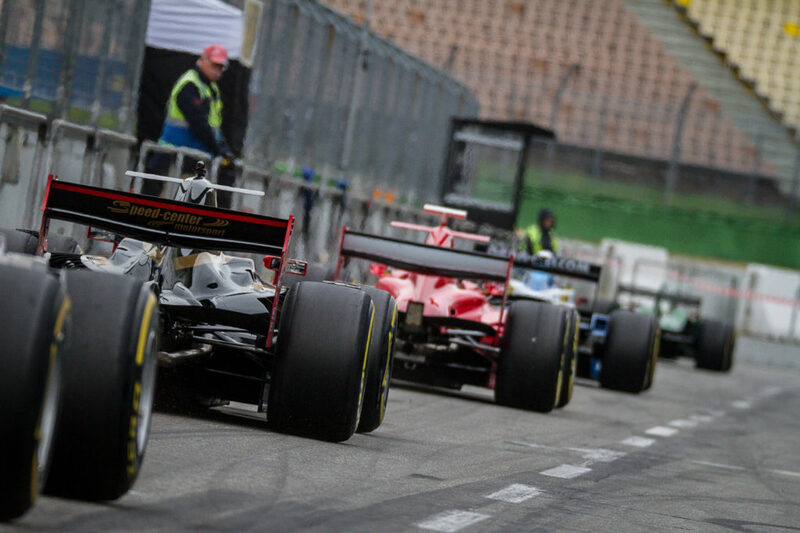 While weather conditions in Hockenheim on Saturday morning were overcast, but dry, couple of thousand spectators on the legendary Formula 1 circuit saw an fascinating qualifying for the season kick off race of BOSS GP. Klaas Zwart turned out the be the strongest competitor for Ingo Gerstl for the pole position. He secured the second position with 1:21.068 min. Johann Ledermair raced the fastest lap at the FORMULA class during the qualifying and will start from third position into the race on the afternoon. 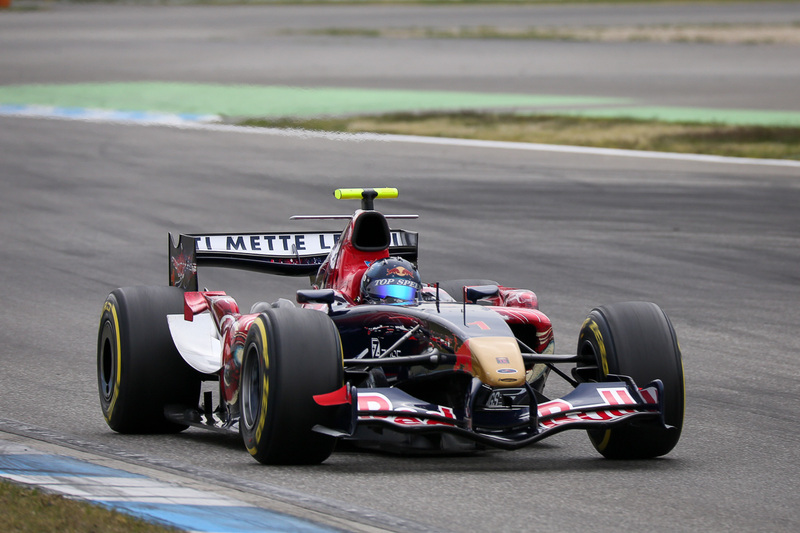 BOSS GP on track while qualifying in Hockenheim. While the best eight drivers out of the free practices on Friday went on track first for ten minutes, to race their best lap time, the remaining eight drivers were following and brought their best performance onto the track for a 20 minutes time slot. 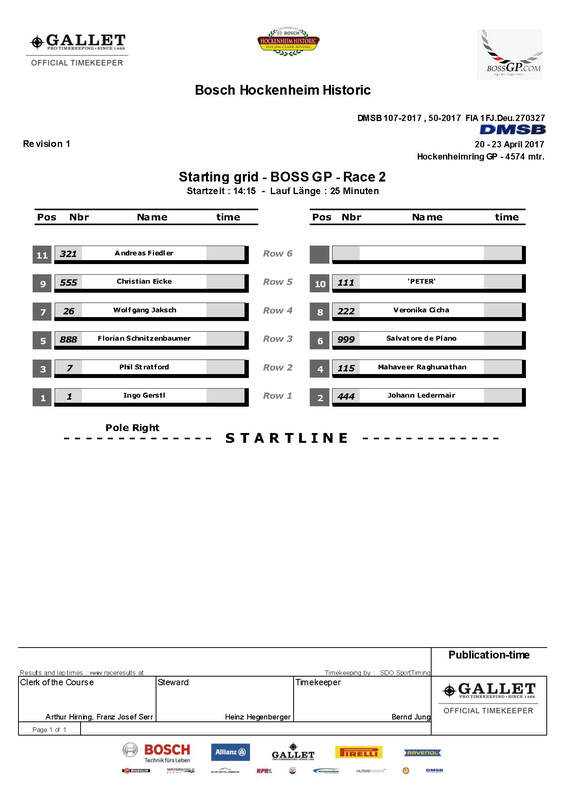 Starting grid of first race of BOSS GP season 2017 in Hockenheim. Detailed statistics of the qualifying at Hockenheim: Hockenheim 2017: Results of qualifying. See the report of second free practice at Hockenheim here: Hockenheim 2017: Report of second free practice in Hockenheim 2017. See the report of first free practice at Hockenheim here: Report of first free practice in Hockenheim 2017. Wolfgang Jaksch (OPEN class) and Walter Steding (FORMULA class) back on track, Ingo Gerstl (OPEN class) and Johann Ledermair (FORMULA class) confirm their good shape again – that’s the result of Fridays afternoon second free practice of BOSS GP at Hockenheim Historic. 14 out of 17 drivers, nine in FORMULA class, five in OPEN class, started the free practice session and finished it as well. As in the morning session the fastest lap of the FORMULA class was driven by Johann Ledermair (Team Ledermair Motorsport), in the OPEN class Ingo Gerstl (TOP Speed) lead the field again and marked the fastest laptime of all drivers once again, even with the slight difference of +0.255 seconds to the morning session. Wolfgang Jakschs Super Aguri, prepared for second practice in Hockenheim. While Johann Ledermair (Ledermair Motorsport) confirmed the first position of the FORMULA class in the second practice, BOSS GP newcomer Andreas Fiedler (Fiedler Racing) made a good impression and finished the session on third position. “I was aiming for a lap time around 1:30 minute”, he explained after the session. “So I am very happy with the result.” Finishing the second practice with the fastest lap time of 1:30.485 min Fiedler greatly improved from the first practice in the morning with a best time of 1:32.239 min. “Since BOSS GP is a new experience for me by now, the goal for the race in Hockenheim is to get a feeling for the characteristics and special features of the series. It’s great competition, great cars, great drivers. For me it’s like a dream coming true, being part of BOSS GP and racing such a great car. Years ago I dreamed of sitting in such a Formula racing car. Now I even drive such a car”, Fiedler, competing with a Dallara Mecachrome 4.0 V8, was full of joy after practice day at Hockenheim circuit. 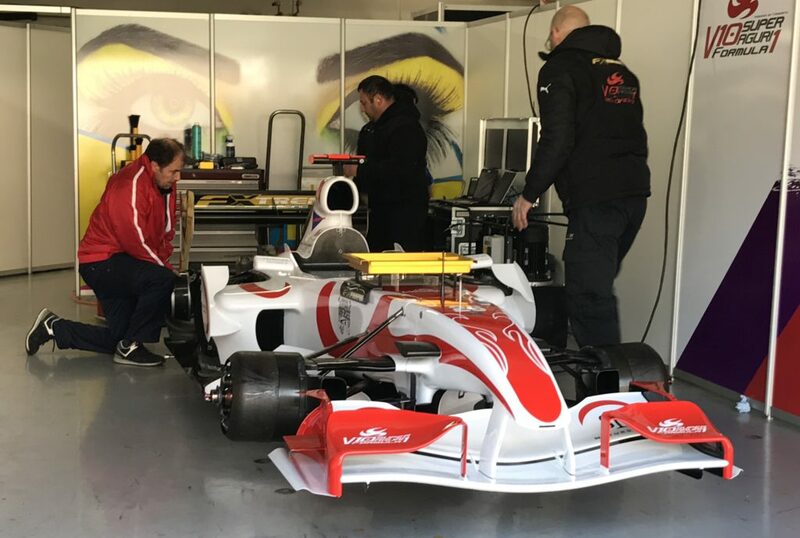 Austrian Bernd Herndlhofer (H&A Racing) missed the second practice of the day in the OPEN class, but Wolfgang Jaksch (F-Xtreme Racing Team), who missed the morning session, returned to track with his newly built Super Aguri SA06 Cosworth 3.0 V10. He made a good first impression and finished on third position with a 1:30.063 min lap best time. Meanwhile Zwart just finished four laps, but will be fully present at Qualifying on Saturday morning again. BOSS GP Paddock in Hockenheim. BOSS GP raceday on Saturday (22/04/2017) starts with qualifying at 10:00 a.m.. The first race is set at the afternoon, 3:15 p.m. The second race will start on Sunday (23/04/2017) afternoon at 2:15 p.m.
See detailed results of second free practice at Hockenheim here:: Hockenheim 2017: Results of second free practice. See the report of the first free practice at Hockenheim here: Hockenheim 2017: Report of first free practice. 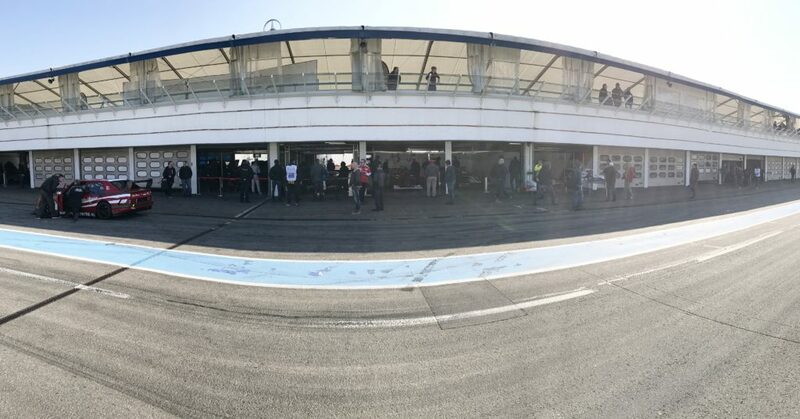 Sunshine and 11° Celsius were awaiting the start field of BOSS GP for first free practice at “Hockenheim Historic” on friday morning as well as the German Formular 1 track at the Hockenheimring and loads of motorsport enthusiasts, which cheered the drivers along the track. 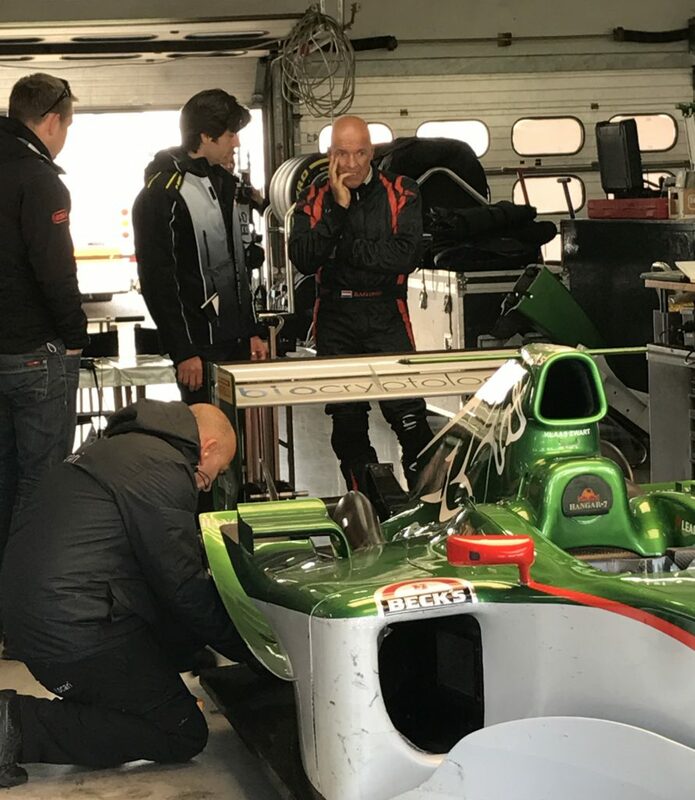 Eight out of the nine drivers, who joined the free practice at the FORMULA class, found their way back across the finishing line, while at the OPEN class all five drivers finished the practice. Fastest lap of the FORMULA class was driven by Johann Ledermair (Team Ledermair Motorsport), who finished the first free practice as leader of the class. At the OPEN class reigning Champion Ingo Gerstl (TOP Speed) managed the leading spot and marked the fastest laptime of all drivers. Couple of drivers were missing. Henk de Boer (FORMULA class, De Boer Manx) had to cancel the first race of the season due to private reasons. Walter Steding (FORMULA class, Inter Europol Competion) gave up the free practice due to technical reasons after a crash on track on Thursday as well as Wolfgang Jaksch (OPEN class, FXtreme Racing Team), who wasn’t ready yet for racing due to technical reasons as well (“We expect, that we will be on track on Saturday. Currently we still have a load of work to do.”). “We hope, that Stedings car will be ready to use on Saturday again. Actually the team is working around the clock for that goal”, explains Christian Gänse, race-coordinator of BOSS GP. 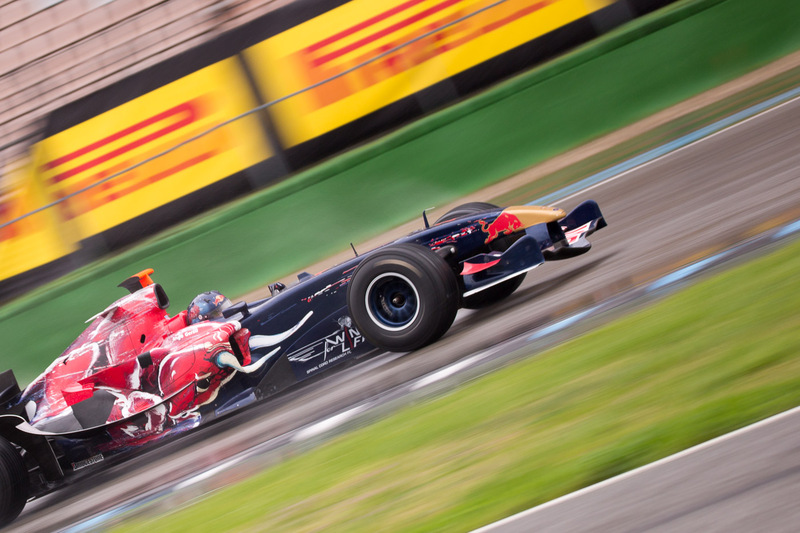 BOSS GP on Hockenheim track. Klaas Zwart discussing the new Pirelli tyres. Second free practice is set for Friday afternoon at 3:40 p.m. Saturday morning Qualifying starts at 10:00 a.m., first race is set for the afternoon at 3:15 p.m. The second race will start on sunday afternoon at 2:15 p.m.
See plenty of details of the first free practice at Hockenheim here: Hockenheim 2017: Results of first free practice. The BOSS GP Championship season opener in Hockenheim this weekend provides three days full programme for motorsport fans and enthusiasts. Starting on Friday morning BOSS GP crew is looking forward to an exciting Kick Off weekend for the 2017 season. Since the entry list for the first BOSS GP season race is set, drivers and crews will follow a timetable, starting with the first free practice on Friday morning at 10:05 a.m. Second free practice will start at the afternoon, 3:40 p.m.
Hockenheim track will be packed full with free practices and already qualifyings of different racing series like Lotus Cup Europe, Canadian-American Challenge Cup or Spezial Tourenwagen Trophy H&R Cup as well as presentations by Raceclub Germany and Scuderia Serenissima whole Friday from 9:00 a.m. until 7:00 p.m.
10:00 a.m. and 3:15 p.m. will be the “magical date” on Saturday for the drivers. Qualifying will be held in the morning at 10:00 a.m, whereas the first race will follow in the afternoon at 3:15 p.m. The “Hockenheim Historic” event will start at 9:00 a.m. and has a timetable of 17 different qualifyings, races and presentations. The second BOSS GP race of the weekend will be held on Sunday afternoon at 2:15 p.m. The general “Hockenheim Historic” timetable provides 14 different highlights on Sunday, races as well as presentations. Find the complete event schedule at the attached PDF-File here: Timetable “Hockenhein Historic” 2017. BOSS GP at Hockenheim 2016. Thousands of motorsport enthusiasts will travel to Hockenheim this weekend, to celebrate plenty of races at the Hockenheim track in Germany. BOSS GP will be part of an exciting motorsport experience at the track near Heidelberg, with hundreds of race cars entertaining the motorsport fans. “Hockenheim Historic” is held in memory of the Scottish double Formula One World Champion Jim Clark (1963, 1965), who suffered a lethal crash in a Formular Two race at the Hockenheim track in 1968. Clark was placed at the top of the “Greatest-ever-Formula-One-drivers”-list by “The Times” in 2009. BOSS GP will compete at seven different European venues in 2017, holding 14 races in total. 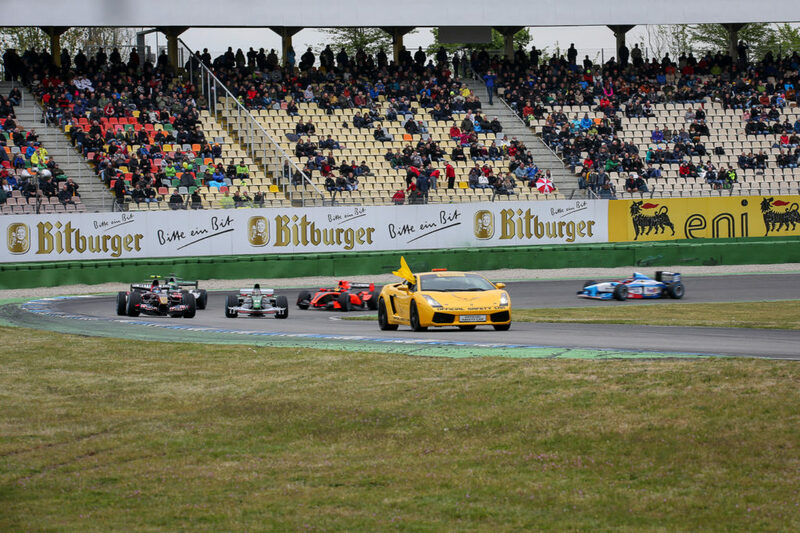 Hockenheim will be followed by Zandvoort in May (20./21.05. ), where BOSS GP will be part of the Race Festival by Max Verstappen. The other tracks are Paul Picard (FRA), Zolder (BEL), Assen (NED), Brno (CZE) and Imola (ITA). 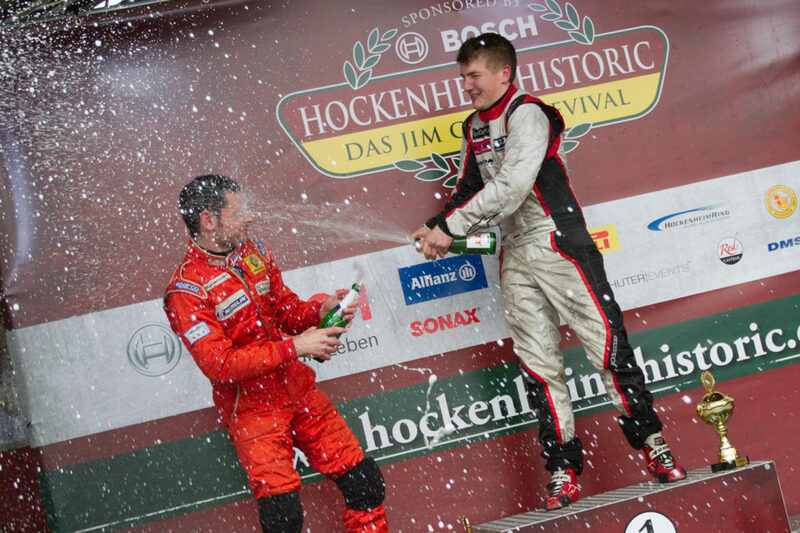 Find all informations about “Hockenheim Historic” on this website: www.hockenheim-historic.de. Coming up this week is the traditional BOSS GP Championship season opener in Hockenheim at the weekend of 22nd/23rd of April. The start list for this unique motorsport event, for drivers as well as for motorsport fans, is set und is promising an exciting Kick Off for the new BOSS GP season at all. As in 2016 BOSS GP will run an OPEN class and a FORMULA class. 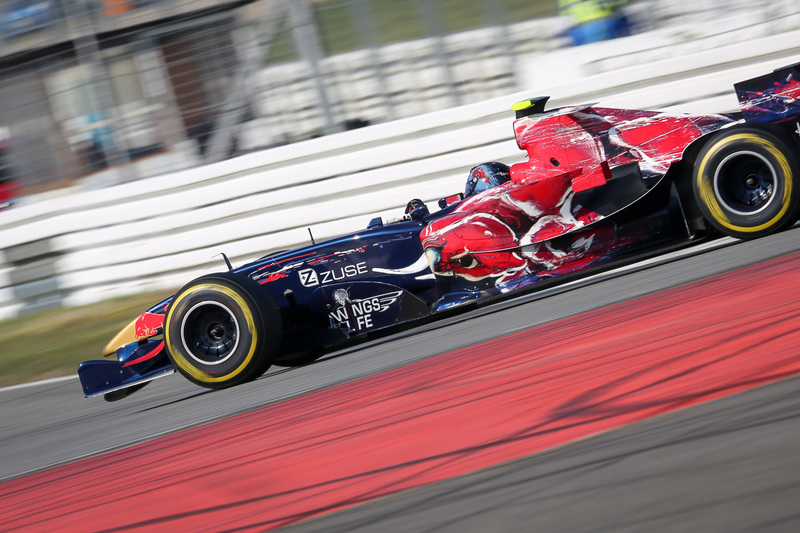 Formula One and Champ Cars will battle for Championship points in the OPEN class, while GP2, Superleague Formula, Auto GP and World Series by Renault will fight for podium places in the FORMULA class. Thousands of motorsport enthusiasts will travel to Hockenheim, to celebrate plenty of races at the famous “Hockenheim Historic” event. BOSS GP will be part of this awesome motorsport experience at the track near Heidelberg in southern Germany, with more than 500 race cars entertaining motorsport fans all over the weekend. BOSS GP will compete at seven different European venues in 2017, holding 14 races in total. 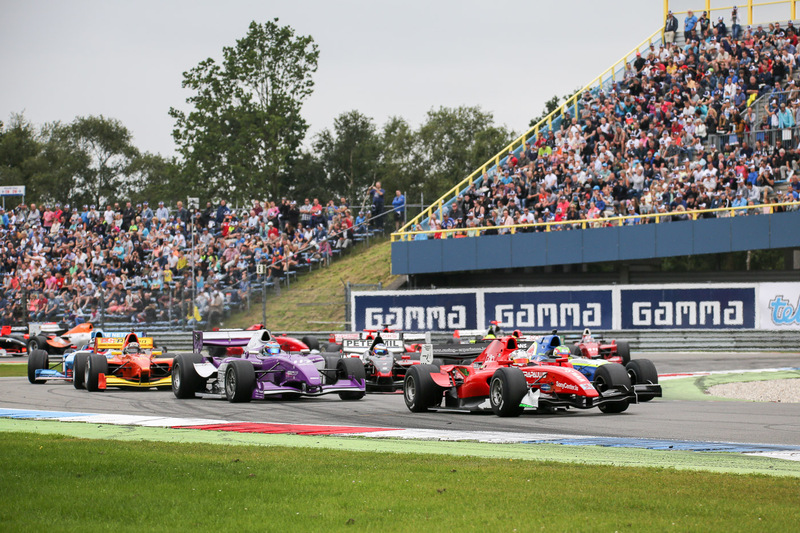 Hockenheim will be followed by Zandvoort in May (20/21), where BOSS GP will be part of the Race Festival by Max Verstappen with more than 100.000 expected spectators. The other tracks are Paul Picard (FRA), Zolder (BEL), Assen (NED), Brno (CZE) and Imola (ITA). Drivers and teams are excited and can’t wait to finally push the pedal for a spectular season full of speed, noise and power! Great news for the BOSS GP Championship season 2017: Counting 36 registrations for the season, which starts on 22nd/23rd of April at Hockenheim in Germany, as many drivers and teams as never before registered for the fastest race series in Europe. Currently running and still open until the 12nd of April is the registration for the first race of the season at the “Hockenheim Historic”. With 36 drivers registered in general for the 2017 season until beginning of April, who actually wont show up each of them at each race due to different reasons, Gaense is yet looking forward to a “top-class field at each of the races of the BOSS GP championship 2017, qualitatively as well as quantitatively. For the Hockenheim season opener we can expect a grid of ~20 cars”. 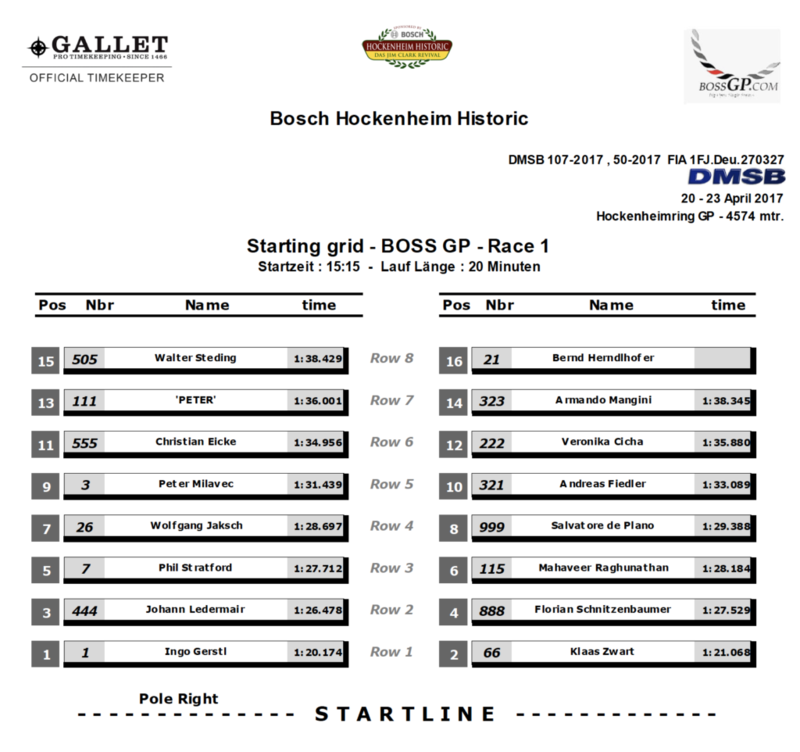 Find all informations about the Kick Off race of BOSS GP and ticket-purchase at “Hockenheim Historic” on this website: www.hockenheim-historic.de.